Yes! Only two days more. We have already received more than 250 votes and currently, 'Arisimparupu sadam' by Ramyacooks is in the Lead followed by 'Cowpea leaves Stir' by Kailas kitchen. C'mon hurry up and vote for your favourite and make them win! Isn't voting Fun! Now coming to my Bell pepper chutney/Dip. Inspired by the VOW Bell Pepper event, I wanted to cook something with Bell Pepper. Usually I do not use Bell Pepper in my recipes because my husband is not a big fan of this vegetable. However, I wanted to give it a try. So I was searching for the round up. I remembered that there was a event with bell pepper but forgot to bookmark it which lead to a big search. Then I decided to make a list of round up, so that it will be easy for people like me. And my thought was implemented within minutes. You know how? Dear Sia had already thought about this and had come up with the consolidated list. You can get the details from this Blog event and round up link. ok. Now I have the round ups and when I was thinking what to prepare, I came across this lovely colourful chutney prepared by Cham of spice-club. More than the recipe, the colour was luring me to cook. So I decided to prepare Bell Pepper Chutney/Dip. 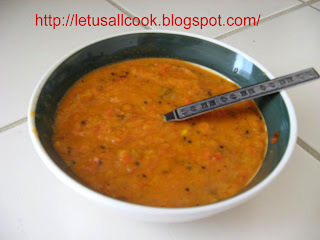 Here is the recipe of Bell Pepper chutney/Dip. I must say, it is one of the most delicious chutneys I have ever tasted. The taste was a little sour, sweet and really good. I am very happy to say it was a big hit here at my house. He like it very much and has requested me to do it again this weekend. Wow! I never knew Red Bell pepper can be so delicious! Thanks Cham for the lovely recipe. The next one in my Bell pepper list is, Uma's Bell pepper bangles! Have a great weekend. Do not forget to Vote! chutney looks great.. loved the color.. ur recipe is very easy.. thanks for sharing. that sure looks so colorful Sangeeth! I love this chutney very much. YOur chutney looks so delicious. Thanks for thinking about trying my recipe. I am so flattered. chutney looking great sangeeth! an event going in my blog too! do participate in it! Thanks Sangeeth for this lovely recipe! I saw Cham's too, and she has sent me some really yummy red recipes:). BTW, the link for the protein rich recipes is showing 'blogger not found'. I did not find my two entries there either:(!! It's a delicious color too! Lovely recipe Sangeeth.. It looks very good! !